Sebastien Loeb claimed a record sixth successive world rally title with victory at the Rally GB in Wales. The Frenchman won the title by a single point from Finland's Mikko Hirvonen, who led Loeb by one point going into the race but could only finish second. "I'm really happy for this one because Mikko is strong," Citroen driver Loeb told World Rally Championship radio. "A sixth title is awesome. It's been a season of highs and lows - it's a huge moment. The battle was so intense." 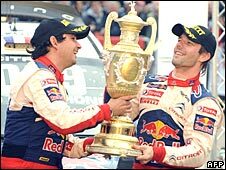 Loeb won seven of the 12 rounds during the season, and the Rally GB victory was the 54th race win of his career. The 35-year-old won by 66 seconds on Sunday but was helped enormously when Hirvonen suffered a mishap on the third of the day's four stages. Having pegged back the Frenchman's overnight lead from 30 to 18 seconds, the Finn was forced to stop when his bonnet flipped up, costing him a minute. Ford driver Hirvonen said: "It was definitely the best year I've ever had but a big disappointment in the end. I need to go back to work and try to find more speed for next year." Loeb's Citroen Total team-mate Dani Sordo finished third, taking the final step on the podium in Wales and securing third place in the 2009 drivers' championship. Britain's Matthew Wilson was sixth and finished the season seventh overall.